About the Silverlake Stadium The original Ten Acres stadium was renamed in 2006 as part of a local sponsorship deal. The stadium has four separate stands, three of which are covered. The grandstand is raised above pitch level and has won a number of awards including Groundtastic’s stand of the year a few years ago. Behind the south goal there is a roofed terrace with four rows of seats in the middle. Opposite the main stand is an uncovered terrace – well a covered walkway actually. Behind the north goal is the clubhouse – a must for all teams at this level. How to get to the Silverlake Stadium The ground is located close to the M3/M27 junction, and a mile or so away from Southampton Airport. If you are driving to the ground then exit the M3 at junction 13 and turn right into Leigh Road, then right into Passfield Avenue. At end of road take 2nd exit at roundabout and then left at next one before turning right into Stoneham Lane for the ground. From the M27 exit at junction 5 and take 1st exit (from the west) or 3rd exit (from the east) at roundabout into Stoneham Lane. You have to pass the ground and the road for the ground on your left, carrying on to the mini roundabout, turning back on the way you came and then turning right into the road some 150 yards away which you couldn’t turn down in the first place (strange I know!). The ground is down this lane on the left. Car parking at the ground is free. The nearest station is Southampton Parkway which is a 20 minute walk away, although the floodlights are visible as you exit the station. How to get a ticket for the Silverlake Stadium Unless Eastleigh get a run in the FA Cup you will not struggle to buy a ticket on the day of the game. The record attendance was versus Southampton in 2007 which still wasn’t a sell out at 3,191. Ticket prices are £10 for Adults and £3 for Under 16’s. Stand transfers are £1 each. 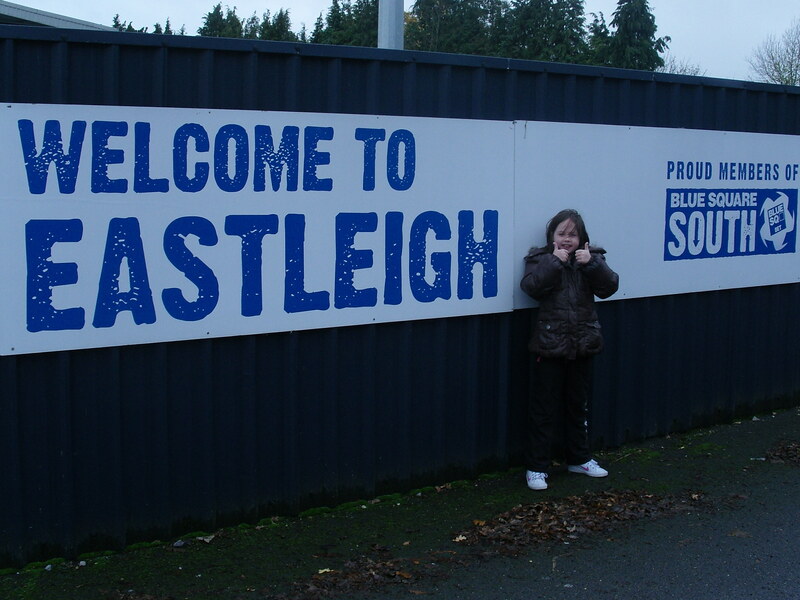 Our last visit – Eastleigh 1 Lewes 0 – 14th November 2009 I still get really really excited about visiting new grounds. Whether they are in some far flung corner of Azerbaijan or round the corner in Thamesmead I spend days planning my route and forming mental images of what it will be like. I am normally really really disappointed but isn’t life in general a series of disappointments? Or is that just me being a realistic West Ham fan? So far November had passed without an opportunity to get to a new ground after a frenzied start to the season which had seen games in 24 new grounds in 8 countires (show off) but I was due to get back on track with a trip down the M3, around the M27 for a mile or so and then up the road to Eastleigh. So after a dreadful run of games on the road Lewes were still without a win in the league away from the Dripping Pan since December 2008 when they beat Salisbury City . The TBIR team had stood in the sunshine of St Albans and Bromley, the gloom at Weston-super-Mare and the despondency at Welling United but here was not just one opportunity, but two in the space of a week. First up was a Blue Square South game at Silverlake to be closely followed by the FA Trophy game the week after. We had again joined the EFW special, which included a number of special guests from our recent European jaunt to Oktoberfest (see review here). 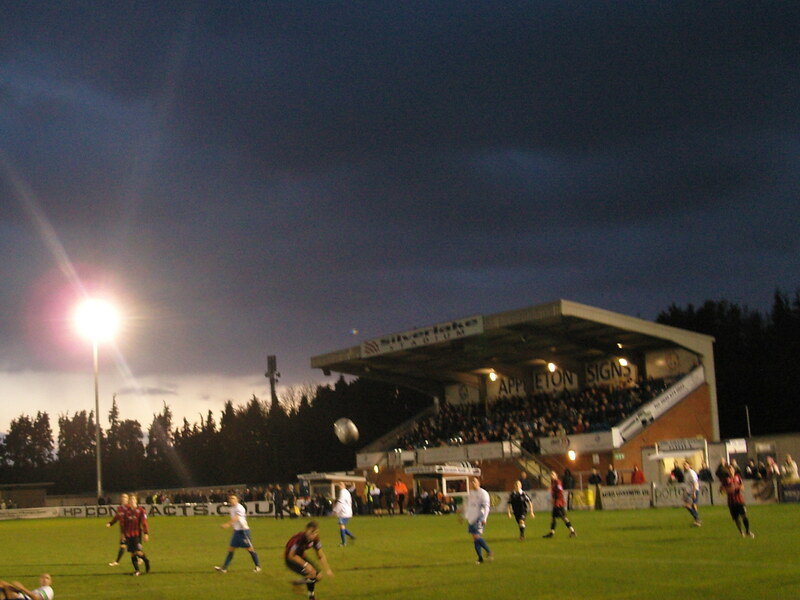 Eastleigh had spent most of their history in the Hampshire and Wessex leagues before promotion to the Southern League in 2003 although two years later they found themselves in the Isthmian League due to a restructure. In their first season they sneaked into the playoffs where a win 4-1 on aggregate to move up to the Blue Square South where they have been ever since, finishing last season just outside the playoffs in 6th place. They are still waiting for a chance to claim a big scalp or two in the FA Cup. Their annual game versus Southampton is normally a high point of the season and they have actually been graced with the likes of Matt Le Tissier, Jason Dodd and err Francis Benali in the past. The club also hold the dubious honour of conceding the quickest ever goal in football when Marc Burrows scored for Cowes Sports FC after 2 seconds. Did we come expecting forgiveness, did we come to raise the dead sang U2 but what did the EFW/TBIR team expect? Lolly still has never seen Lewes win, and we were beginning to think she was our unlucky Talisman, but based on the fact that Cynical Dave had seen every game this season of which the team had only one twice we decided not to banish her just yet. After my sabbatical from football of three weeks (I don’t include West Ham as football anymore so the games against Aston Villa and Everton had been erased from my memory) I was raring to go. I had missed the cut and thrust of abusing the linesman, the weirdo’s who randomly shout out scores from Walton Casuals to nobody in particular and of course the beer. Who can forget the beer at this level. Cheap and available to consume whilst the game is going on. But anyway, we were here to follow the Rooks, and in Lolly and I’s case Arnie. The scores on the door of the EFW/TBIR Annual Memorial Trophy were piling up in favour of Crabbie, primarily due to his three goals to Arnie’s none, but two weeks ago the scores had got a bit closer after the judging panel awarded him 10 points for his sending off after the final whistle at Welling for an impressive tirade of abuse aimed at the hapless referee. We have come to see poor referees at this level, but Mr Harris took the award for “Keith Hackett and Graham Poll’s lovechild” and Arnie simply forcefully pointed out some home truths. It’s not big or clever kids but it made us laugh and it was worth 10 points in anyone’s book but it meant he was excused from this game. The morning of the game dawned as if it was indeed the End of the World. Yesterday (Friday the 13th) had seen the release of the film 2012, which graphically fulfils the Mayan prophecy of the end of the world. Well many would have thought the prophecy was starting to happen when they looked out of the window. Hail, wind and rain were the order of the day and there was some concern in the Fuller household that we would not have a game to go to at all. But set off we did and arrived in Eastleigh at 1.15pm to be met with the sight of a dozen or so people trying frantically to sweep the water off the pitch. At 1.30pm it was odds on to be cancelled and so we started frantically looking on the old Blackberry for alternatives – Aldershot, Gosport Borough and Andover were the viable alternatives. Our visitors from Germany and Belgium looked like they may be going home disappointed but we were saved. The referee had called the captains into his room and told them the game would go ahead as otherwise he had to go shopping with his wife. So Golden Goal envelopes unopened in our pockets we headed outside just in time for….. Just over 60 seconds on the clock and Scott Manning failed to get his body behind a low cross and ended up putting the ball into his own net. Not the start he would have wanted, especially as he was in the team to replace the in form Anthony Barness. The wind was blowing strongly towards Rikki Banks in the first half but Lewes slowly started dragging themselves back in it. I sent Lolly off on photography duties and watched as the team who a few weeks ago would have crumbled at such an early set back rolled up their sleeves and started playing some football. Joe Keehan thought he was Glenn Hoddle with some of his attempted passing but Lewes dominated the first half without creating a chance of their own. Fortunately the rain had stopped and for a few seconds the sun shone through the clouds, giving us a glimpse of summer again. Half time saw us seek sanctuary in the club house where happy hour had ended and we have to pay full price (£2.50 I ask you!) for our beers. Our guests from across the Channel seemed to be enjoying the day. I sat with Michael as he tried to understand the rules of rugby from the Scotland v Fiji game on TV. “Cricket I get, but this game is just full of hooligan”…I bit my lip instead of launching into my normal tirade about the beauty of rugby. The second half continued much as the first half had ended with Lewes simply battering the Spitfires. Keehan’s passing was still too long and the greasy surface meant that the ball spent more time out of play than in. They still couldn’t force a save though out of the Eastleigh goalkeeper which was frustrating. 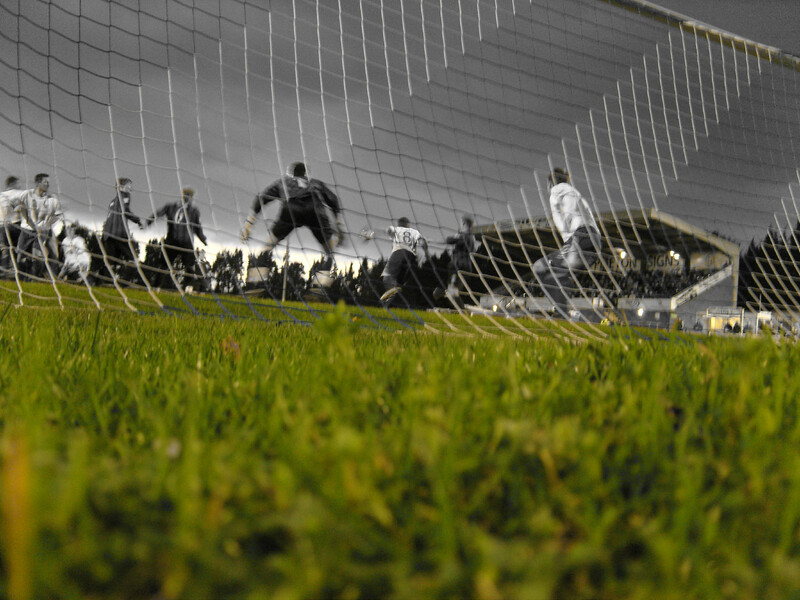 Lewes came close to their deserved goal in the 87th minute when Breach’s header smacked against the upright. But it was not to be. Another defeat on the road for the Rooks which was hard on them. And they have to do it all again in the same time, same place next week… We didn’t stick around afterwards, dropping the EFW team at the station before we headed back north, listening to the dire fest being played out in Qatar. A Blue Square South game played in the aftermath of the biggest storm for a couple of years in front of 400 people or England 3rd XI v Brazil in Doha in a sterile atmosphere-free stadium? Eastleigh anyday please! FA take note – you are hijacking our national game for your own agenda and ignoring the plight of the small clubs. Is it the end of the world as we know it? It certainly is if the FA continue on their quest to prostitute our national team!